In the middle stage of Alzheimer’s disease, those who were care partners now become hands-on caregivers. 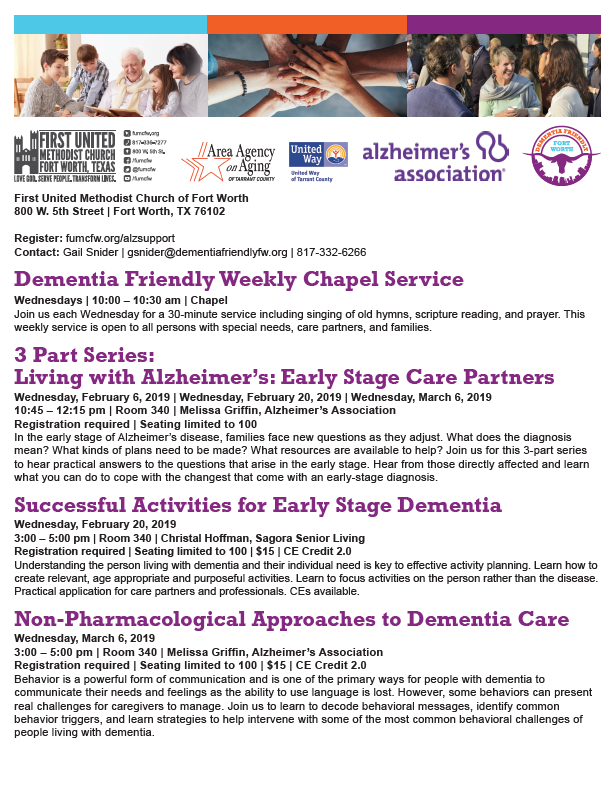 Join us for this 3-part series and hear caregivers and professionals discuss helpful strategies to provide safe, effective, and comfortable care in the middle stage of Alzheimer’s. Communication is more than just talking and listening — it’s also about sending and receiving messages through attitude, tone of voice, facial expressions, and body language. As people with dementia progress in their journey and the ability to use words is lost, families need new ways to connect. 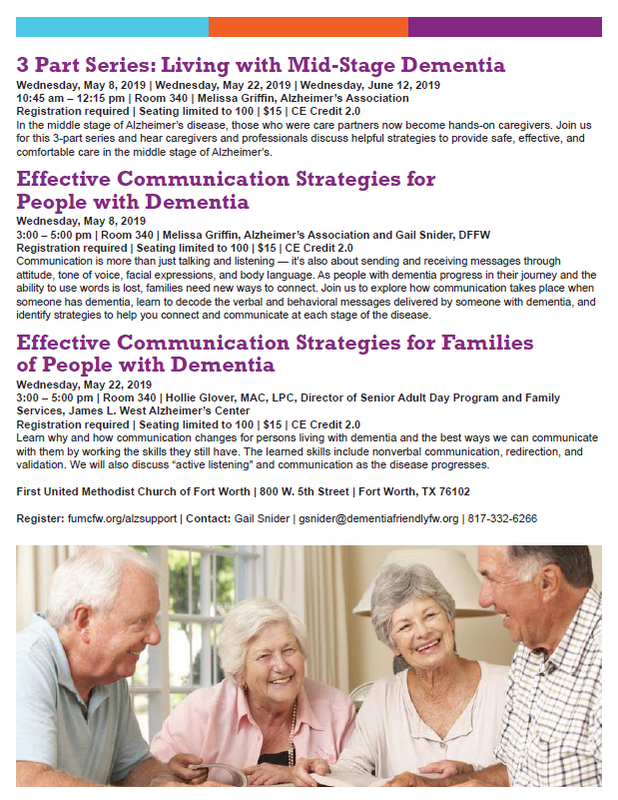 Join us to explore how communication takes place when someone has dementia, learn to decode the verbal and behavioral messages delivered by someone with dementia, and identify strategies to help you connect and communicate at each stage of the disease. Learn why and how communication changes for persons living with dementia and the best ways we can communicate with them by working the skills they still have. The learned skills include nonverbal communication, redirection, and validation. We will also discuss “active listening” and communication as the disease progresses. Join us to learn more about caregiving topics, such as Long-term Care Options, Having the Talk, Geriatric Care Management, Estate Planning, and Caring for the Caregiver. Lunch provided. Space is limited. The Long-Term Care Ombudsman Program promotes advocacy that results in a better quality of life for the frail elderly in Dallas County nursing homes and assisted living facilities. Ombudsmen serve as resident-directed advocates who investigate complaints, report findings, and help achieve resolutions. An ombudsman is specially trained and certified to advocate for residents’ rights. To learn more about the role of an ombudsman, please click the hyperlinks and watch two YouTube training videos from the State Long-Term Care Ombudsman Program: Advocacy and Communication Skills: Scenario 1: Anne Walker and Scenario 2: Brian Brashear. As you can see from the videos, the role of an ombudsman can be challenging, yet very rewarding. A criminal background check, conflict of interest screening, and reference checks are required by state law before you can attend Training 1 and 2 sessions. Must complete a three-month internship at a predesignated nursing home or assisted living facility and attend both training sessions to be eligible for certification as a volunteer ombudsman. Deadline to submit required documents is March 15, 2019. For more information on how to become a volunteer ombudsman call 214-525-6131 or email: mevans@theseniorsource.org. Medicare fraud costs all of us – and it could happen to you or someone you know! Learning about the common scams targeting seniors is a great step in protecting yourself – and your family. In this informative presentation, experts from Texas’ Senior Medicare Patrol (SMP) will help you recognize Medicare fraud and what you can do to stop it. Armed with an increased awareness and understanding of healthcare programs, you can protect yourself from the economic and health-related consequences of Medicare fraud, error and abuse. Behavior is a powerful form of communication and is one of the primary ways for people with dementia to communicate their needs and feelings as the ability to use language is lost. However, some behaviors can present real challenges for caregivers to manage. Join us to learn to decode behavioral messages, identify common behavior triggers, and learn strategies to help intervene with some of the most common behavioral challenges of people living with dementia. FREE Event • Light breakfast and lunch is provided. This is a FREE event, but registration is preferred. Dress casually and consider wearing your favorite football team’s jersey. at alznct.news/aacareseminar19 or call 1-800-272-3900. This symposium is an interprofessional activity designed for physicians in geriatrics, internal medicine, and primary care, hospitalists, pharmacists, advanced practice providers, nurses, physical, occupational and speech therapists, dietitians, pastoral care, hospital administration and allied health professionals throughout the community who care for geriatric patients. Click to access additional information. This event is sponsored by the Hoarding Task Force of Tarrant County. This 1/2 day workshop will include breakfast and CEUs for LPC, LMFT and LCSW. CEs for Code Compliance and guardianship. Topics will include Hoarding 101, Working with Vulnerable Adults, Hoarding: A First Responder's Perspective, and Animal Hoarding. For information or questions, please contact Beth Noah at Beth.Noah@unitedwaytarrant.org. Continental breakfast sponsored by: WellBridge Healthcare.